Hello Aspirants, In this article National Highways | Questions asked in CDS, AFCAT, NDA Exams we have covered about the important topics which carries important part in the exams. So candidates can go through this and test their knowledge based on the topic. There are always on this topics which really confuses during the exams so we tried to keep it simple for the aspirants preparing for the exams so that it would be easy for them to understand and differentiate between the classification of the Highways. Go through the article and keep following us for more such questions and answers tests. We have also given the link for more such quiz tests which you can take for the exams preparations. 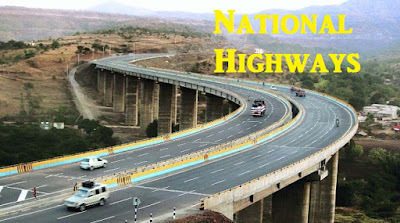 India has the 2nd largest road network in the world spreading over 4.24 million kms at present, consisting of national highways(NH), expressways, state highways(SH), district roads and village roads.The total length of NH (including expressways) in the country at present is 93,051 km. While highways constitute only about 1.7% of the length of all roads, they carry about 40% of the road traffic. NH1 → Amritsar to New Delhi. NH1A → Jalandhar to Uri (Only highway passing through Jawahar Tunnel). NH2 → New Delhi to Kolkata (NH-1 and NH-2 are collectively called as the Grand Trunk Road). So this was all about National Highways | Questions asked in CDS, AFCAT, NDA Exams. We would keep posting such questions articles for our readers so that you can prepare for the exams. All the important topics would be covered with this notes which are most important for the exams and are very essentials as per the exams point of view. If you need any help for notes do comment below and if you have doubts regarding National Highways | Questions asked in CDS, AFCAT, NDA Exams comment in below comments.